There is currently just the 1 ferry route running between Magnetic Island and Australia operated by 2 ferry companies – Fantasea Cruising Magnetic & Sealink Queensland. The Nelly Bay to Townsville ferry crossing operates daily with a scheduled sailing duration from about 25 minutes. Whilst we’ve taken great care to ensure the information on this page is correct, as the frequency and duration of crossings on all routes can vary from time to time we’d advise that you get a live quote for current availability on this Magnetic Island Australia crossing between Nelly Bay and Townsville. 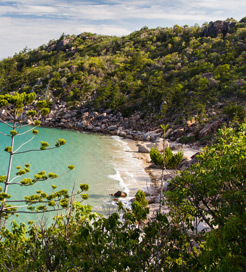 Magnetic Island lies just offshore from Townsville in Queensland, Australia, boasting the region’s sunniest climate. Over half of this beautiful island is classified as a national park, so it is home to an array of wonderful wildlife including koalas, rock wallabies, possums and a number of colourful bird species. The island’s 40-kilometre coastline is blessed with some of the country’s most picturesque beaches and, if you’re an experienced scuba diver, you have access to one of the finest shipwreck diving sites in the world, SS Yongala, a passenger ship that sank in 1911. Magnetic Island is a popular spot for a short excursion from Townsville and so there are fast and frequent ferry crossings back to the Australian mainland departing from Nelly Bay on the southeast coast. Australia is the world’s sixth largest country, by land area, consisting of the mainland, Tasmania and thousands of smaller offshore islands. For such a massive nation, the population only reaches around twenty-four million, culminating in a huge expanse of breath taking, untouched wilderness, known as ‘the outback’, with almost ninety percent of Australians residing in coastal cities. 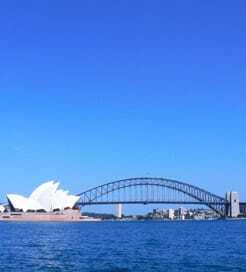 Sydney, the largest of which, boasts a collection of beaches and trendy bars alongside its iconic Opera House and Royal Botanic Garden. Australian excursions include jaunting off to the Whitsunday Islands for Great Barrier Reef diving, or hopping over to Kangaroo Island for its wonderful National Park, while the Tiwi Islands, in the north, showcase the fascinating Aboriginal way of life. With numerous islands around the Australian coast, travelling by ferry is the best way of reaching the mainland, allowing you to enjoy the brilliant oceanic views along the way.